I am pleased and excited about the launch of my first blog in tandem with an upgraded internet presence on Facebook, Instagram, Twitter and Pinterest! I have always believed and continue to know the real estate business is about personal relationships. In the last couple of years, I’ve had so many requests for articles and tips and inside juice on the business – so I’ve engaged the services of Voxdeae Productions help me give you what you want! 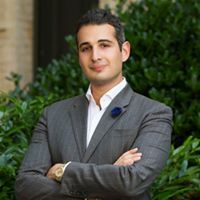 For those of you whose acquaintance I have not yet had the pleasure of making, my name is Sammy Dweck and I am a Broker Associate at TTR Sotheby’s International Realty in Washington, D.C. It has been my honor to serve buyers and sellers in the District and the Virginia and Maryland suburbs since I was twenty years old. My business philosophy is that my clients are placing their trust in me with regard to their homes and their money and I have the task of earning and enhancing that trust relationship to the end of getting my clients where they want to go. I take a creative and holistic approach to every situation and transaction and strive to provide a level of professional service that caters to my clients’ desires while simultaneously furnishing them with an honest and realistic picture of the market conditions. A winning strategy is paramount to a successful sale. It has been my great privilege to use my talents, knowledge, and experience to help hundreds of incredible people create their homes in Washington as well as convey them to the next owners. For me, assisting someone with their home decision is deeply personal experience, and I believe strongly that it should not be an impersonal business transaction. I am trusted with a milestone in many people’s lives, and I take great pride in the fact that over the course of our work together, many of my clients have become very dear friends. Living in Kalorama and hanging my license at TTR Sotheby’s International Realty, I am right at the forefront of life in DC. This enables me to give my clients the inside scoop on both on-market and off-market properties in the heart of the city. When I provide knowledge of neighborhoods and upcoming areas, it is based on personal experience and careful discovery. Not only with client relationships, I have worked hard to develop an extensive network of excellent professional relationships with other brokers to help my clients buy and sell in a competitive market with very tight inventory, which often leads to smoother transactions and occasionally knowledge of a property before it goes to public listing. Home buyers and sellers will discover that like webMD for ailments, they have access to a veritable flood of internet sources and advice – my job is not to be a gate-keeper, but rather an objective interpreter and advisor. I plan to use this blog to impart some of the valuable insights I have gained in my career, success stories that others can learn from, and some of my own personal anecdotes just for fun. I hope that you will find great value in the forthcoming information on this blog, and hope you will use the comment section and social media to connect with me! Great! So how do I sign up to receive it? Hi Susan! I have added a “follow” button on the upper right hand corner! If you enter your contact information, you’ll receive emails whenever I create a new post!